When the word “phoebe” comes up, most people automatically think of things like the outermost of Saturn’s known satellites, the Greek Titan-goddess of the moon, or the most fascinating and complex character from that happily departed sitcom, Friends. Anyone who has gone bird watching in North America, however, knows another kind of phoebe, a bold little genus that turns up with remarkable frequency from the arctic circle to the equator. Phoebes are proud members (at least they seem so) of the Family Tyrannidae, the tyrant flycatchers. These New World flycatchers are almost uniformly aggressive insectivores, but vary widely in size and plumage. Of the more than 400 tyrannids, as birds in this family are sometimes called, only three belong to the genus Sayornis, the phoebes. However, what the phoebes lack in diversity they more than make up for in personality. The Eastern Phoebe (Sayornis phoebe) is common everywhere in the U.S. that might even vaguely be considered the East, and other parts besides. This bird is almost certainly the most common flycatcher within its range. It is also one of the most recognizable with its rounded head and telltale tail pump. Bigger than an Empidonax flycatcher and smaller than a Myiarchus, the Eastern Phoebe is usually only mistaken for a pewee, and even that becomes unlikely with experience. This phoebe of phoebes is considered a loner as far as its own kind is concerned, but doesn’t appear to mind human presence. In fact, this is one species that seems to thrive in the face of rampant development. Because Eastern phoebes are early migrants, they serve as a sweet harbinger of spring. 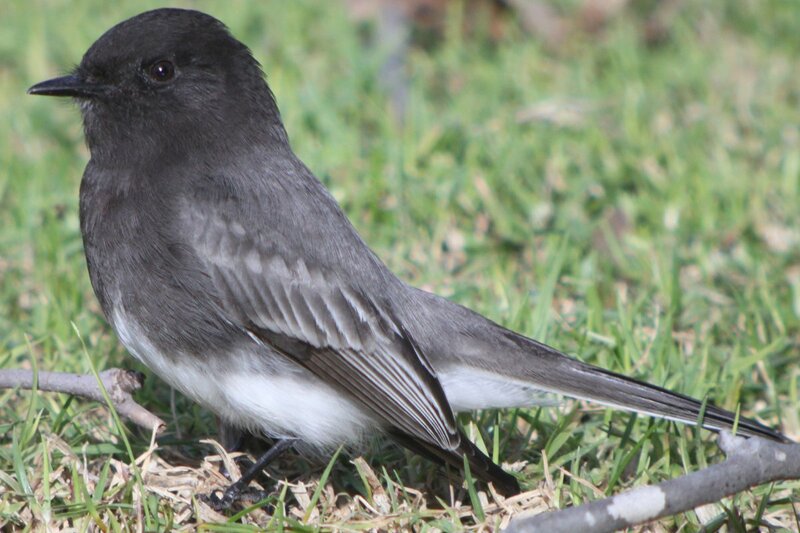 The Black Phoebe (Sayornis nigricans) won’t be mistaken for any other bird; nothing else that size shows such dark plumage with a white belly to contrast. This phoebe is a fixture in the American Southwest and Central America and can be spotted all the way down to Argentina. Black Phoebes eat bugs with the same gusto as any other flycatcher, but will also go after tiny fish. 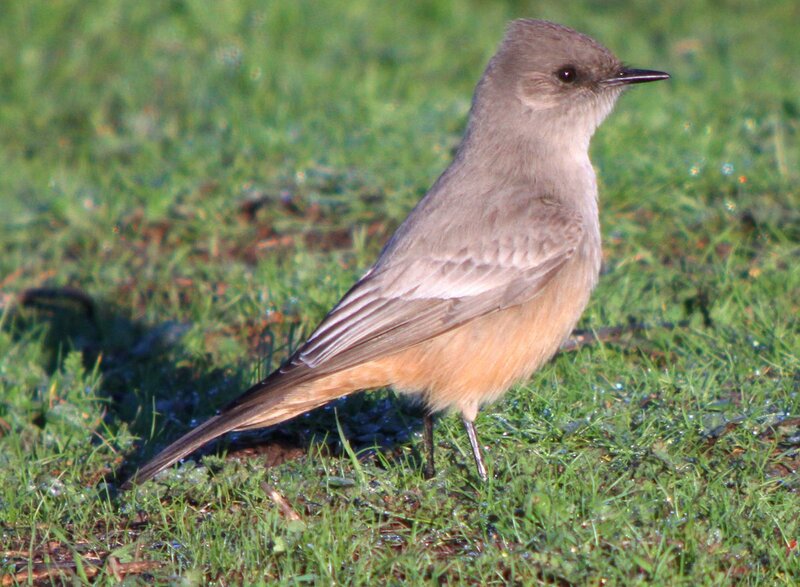 Say’s Phoebe (Sayornis saya) is the most colorful of the phoebes, gray above but a smart buffy orange below. It’s also the hardiest, breeding as far north as the Alaskan arctic, much further north, in fact, than any other flycatcher. Looking at its range map, this phoebe seems to have split the U.S. with its eastern cousin. Say’s Phoebe is named for the noted American naturalist, Thomas Say, who provided the first official descriptions of this bird and a number of other western species. 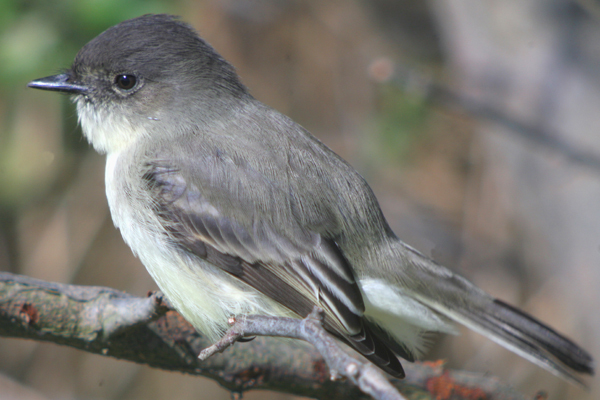 One might find it ironic that Say, considered the founder of descriptive entomology in the United States, has a bird named for him, but the fact that Say’s Phoebe is a flycatcher seems rather poetic. @parakeets: If the bird is capable of flight let it go. Otherwise, small portions of ground beef (you might have to force it into the bird’s mouth until it learns to eat it) until you can get the bird to a wildlife rehabilitater. Heather. if the birds still need to be cared for and you know where the parents are, leave the nest there. The parents are not at all put off by the scent of humans, but they probably won’t approach the birds in your presence. If you’re going to try to feed them, consider Corey’s suggestion above of ground beef. You should also consider contacting your local bird rehabilitation center for more information. Good luck! Our phoebes (NH) are feeding off the ground which I’ve never seen them do before. We seem to have fewer mosquitos this year and assume they have inadequate insects to eat. Is there anything I can put out for them to eat? I’m not sure, Paul. Phoebes catch most of their meals on the wing and apparently will dine on crawling insects but I’m not sure what kind of food you could tempt them with. I wouldn’t worry – phoebes seem to be rather adaptable survivors. I am raising a baby Phoebe. I have been feeding him soaked dog food and fly’s,but this morning he is not doing well. What do I feed him? I have raised meney birds with the same thing. he’s looking worse by the minuet !!!!! Natalie, if ground beef, dog food, or flies won’t do the trick, I’m not sure what to suggest. Is there a wildlife rehabilitation center in your area that you can call? Hi Natalie, I just finished hand feeding 6 baby phoebes and I used Kaytee Exact hand feeding formula. You should be able to find it at any of your local pet supply stores, I just recently bought a container of it at Petco. Kaytee Exact has all of the protein and nutrients that any baby bird needs. I am not sure how old your baby is but I use a small plastic syringe for feeding. Good Luck to you and your baby Phoebe, let me know how it goes. Thanks for the information,it is much appreciated. he is a eastern Phoebe, and I have had him for a week now. Oh, and I was wondering about the ground beef, is there any special brand I need to get? I am assuming that your baby Pheobe is doing well now, I am so glad! I am not sure about the ground beef, I never fed any of my babies ground beef or anything else besides the Kaytee Exact hand feeding formula and millet sprays. As soon as they started picking at the millet and fruit I would give them, I decided it was time to release them. They know live in the palm tree in my front yard and dive bomb us when we are in the pool. They are always around, it’s great! Good Luck with Cherrio and if you ever have any questions please don’t hesitate to ask. I started feeding him a different kind of dog food, so that could have made the difference. Have you raised any other birds,I have raised,a starling,and some kind of sparrow (We never knew what he was) and a few others, and now Cheerio. I could send you some photos of them if you want. I wold love to send you some photos of my last bird (he was a phoebe to) he was crippled but he was special. I would love to keep in touch. Heather, thanks so much for helping out with Natalie’s question. Paul, thanks for the fantastic verse. I am so excited to have Mr & Mrs Phoebe in my yard. We had a pond/waterfall put in last year and they have been visiting us since. And I think they like it because they have built a nest. Up under an eave and hidden from all. Made of mud and grass. I think she recently layed her eggs. I be keeping my eyes out for those little guys when they get here. And I think they are territorial because they chase other birds away from the pond. They think it’s theres alone. Funny birds to enjoy in the backyard. Hi, just found few day old phoebe’s. I’m trying to get bugs into their tiny mouths – much more difficult than you’d think. Any suggestions? Can I feed them worms? @Renee: I would suggest contacting a wildlife rehabilitator: if you google search you should be able to find one near you. I imagine that if you can’t get bugs into their mouths that chunks of earthworms can substitute until you can get the bird to a person who knows what they are about when it comes to raising birds. An Eastern Phoebe has just built her nest around a ten penny nail on my front porch. It just happens to be right over the step down into the yard. It took me a couple of days to determine the kind of bird she was since I am not very well educated about the different kinds of birds in my area. I was worried about where she built the nest, but my coming and going hasn’t seemed to deter her at all. She started spending the night in the nest even before she finished it completely. If I go out at night, she raises her head and watches me. I hope she continues to be tolerant of me. I mostly cater to hummingbirds and have hundreds come to my porch every year for nectar. I am a little concerned that it might be a problem during the peak season for the hummingbirds because I have to refill the feeders every single day to keep the hummingbirds in nectar. One of the feeders is just about one foot below and about two feet to the left of her nest. There’s a good case to be made that Vermilion Flycatcher is also a “phoebe,” even though it’s not a Sayornis. I haven’t heard that before, Rick, but can absolutely see why. Vermilion Phoebe isn’t quite as catchy though! The Phoebes in our yard spend all day swooping on dog poor catching the flies. Gross but they are well fed. We have had the pleasure of having a black phoebe visit us every day for about the last two months. We have been feeding him mill worms. He will get very close, within 4 feet of us. He now calls us when we are indoors. On several occasions he has followed us to other friends homes. (over 30 miles away) Our friends and relatives can not believe this is true, but we know it is. We feel very fortunate. He is a beautiful bird. Please let me know if you have heard of this happening to others. A black phoebe began visiting and perching on a chair near the pool several months ago. It seems to like hearing my voice, so I greet it each time it calls to me. It hasn’t followed us that I know of, but we were away for 5 days last week and when I put the kitchen blind up the morning after returning he came fluttering very close to the window in a more excited manner than usual. Today, I heard him chirping and there he was perched very close to the window with a moth fluttering in his beak. Almost as if he wanted to show me his catch. Barbara, have you gotten close enough to see that the babies are still alive? I don’t know that much about Phoebes, but when I had one nest on my porch, the parents were very diligent in taking care of the babies. Even when one fell out of the nest early they still took care of it along with the others. If you scroll up and read Heather’s comments she gives the best advice on feeding babies that I know if it comes to that. Please let us know how it turns out. They are probably somewhere nearby – birds often move along a bit after the young fledge. Phoebes sometimes have a second brood as well. Thanks, Corey. As a matter of fact, I have seen a bird flying under the deck today, which is where the nest is, so mom & dad may be thinking about that second brood. Couldn’t tell if it was a phoebe, but I’ll be on the lookout. We need them for bug control! I have a nest of Black Phoebes on my veranda lamp. There are 3-day old three nestlings. I don’t believe the parents are feeding their babies enough though, and am wondering if I should do any supplement feeding? 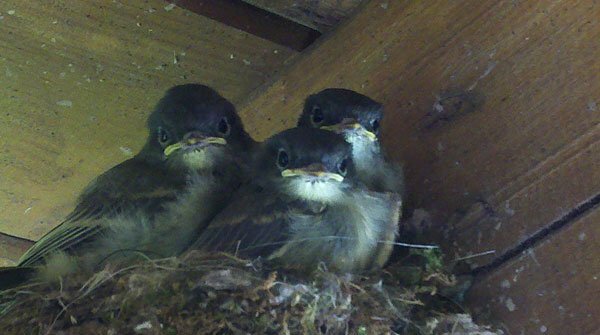 We have a nest of Eastern Phoebes over our back door. Four chicks hatched and the parents were very attentive, feeding constantly. After two weeks of a feeding frenzy, the chicks died. We were heartbroken! Any possible reasons for them to die suddenly? To add…we have had cooler temperatures and a lot of rain for the past week. Even through the rain, the parents were fetching food constantly. Mysterious. Nest under eve with four phoebe babies and babies died in nest fully feathered looking ready to fly. Parent keeps coming to site, what would cause? A young bird flew into our patio door today and it is ok. I think it is an Eastern Phebe. It’s breast is real flecked,. Two black lines on head, sharp bill, v shaped tail and it moved it’s tail from side to side. We had a pair earlier this Spring and I hadn’t seen them lately. We live in Central Illinois and I had never seen any in our area before. I sure hope it is a Phebe and we have more next year. From my description I hope you can verify it. Where Are You Birding This Second Weekend of November 2015?